Yesterday the Guardian published an article on my favourite energy solution. It's called Concentrating Solar Power (CSP). It's a simple, potentially wide ranging and hugely effective solution to our energy needs - not just for the UK, but for the whole of Europe and beyond. Just three vital components are needed - lots of sunshine, lots of space and lots of mirrors, which are arranged so that they focus the sunlight into a small area. This is how it works: the sun hits the mirrors, which then concentrate the sunlight to create heat. Ever done that ladies survival trick of using a compact-mirror to light a fire? Well, it's a similar principle, except rather than lighting twigs the heat created can be used to generate electricity by raising steam and driving a Stirling turbine, just like a conventional power station. The electricity can then be transmitted via very efficient high-voltage direct-current cables (‘HVDC’) throughout Europe, the Middle East, North Africa. Some of these HVDC transmission lines are in place already but more would be needed in the proposed new system. The heat from a CSP plant can be stored so that electricity generation may continue through the night and on cloudy days. 1. CSP works. 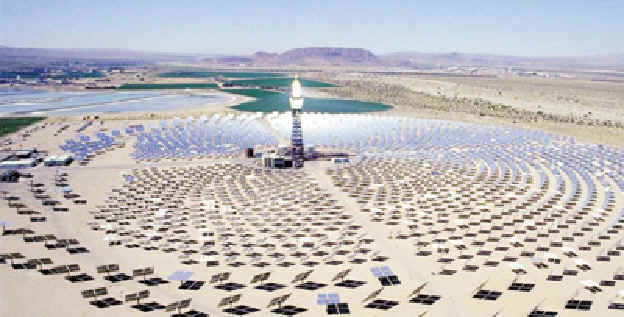 There are CSP plants operating successfully in California, Arizona, Spain, the Nevada desert and Southern Australia. 3. CSP has huge potential in terms of scale. Every year it pours down the equivalent of 1.5m barrels of oil of energy for every square kilometre. 4. A Europe-wide grid of HVDC Transmission lines could be stored underground and even under the sea. 5. Although capital costs would be high, running costs and maintenance would be low. After all, no uranium or fuel needs to be found - it is merely dependent on the sun as it's constantly renewable source of energy. 6. Studies by the German Aerospace Centre demonstrate that by covering just 0.5% of the world's hot deserts with CSP would provide the world's entire electricity needs, with the technology also providing desalinated water to desert regions as a valuable byproduct, as well as air conditioning for nearby cities. 7. CSP is cheaper than oil (currently at $60 per barrel and increasing), calculated at around $50 per barrel of oil equivalent for the cost of building a plant, falling sharply to about $20, as the production of the mirrors reaches industrial levels. It is about half the equivalent cost of using the photovoltaic cells that people have on their roofs. The TRANS-CSP Report estimates that CSP electricity delivered to London would cost about 5.5 eurocents per kilowatt-hour, including the cost of transmission. 8. The electricity generated can be transmitted over very long distances with transmission losses of no more than about 3% per 1000 km. 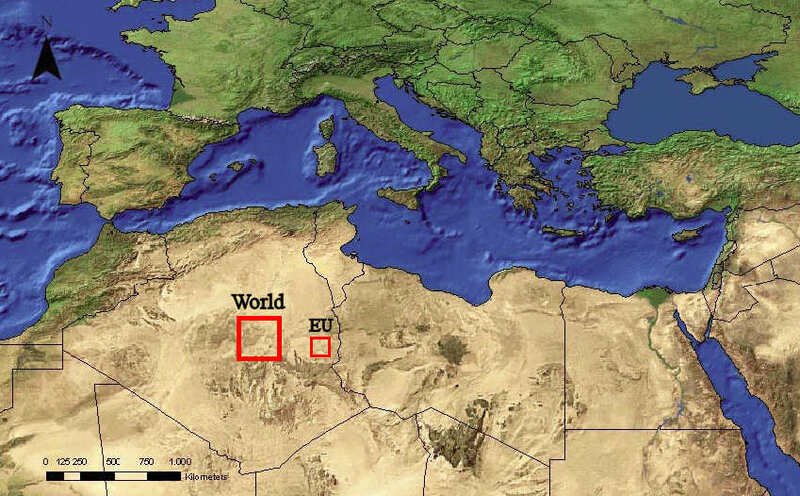 For the whole of Europe, the Middle East and North Africa, it is estimated that average transmission losses would be about 10%. Considering that the ‘fuel’ is free, this compares well with the 70%+ losses that have been accepted for many years in conventional coal-fired power stations (where the fuel is far from being free). 9. Unlike nuclear with it's storage problems, unresolved sequestration issues, high cost of obtaining uranium and high risk of terrorist intervention, CSP has none of these disadvantages. 10. It's a brilliant solution. The German scientist Dr Gerhard Knies states "Contrary to what is commonly supposed it is entirely feasible, and cost-effective, to transmit solar electricity over long distances. Solar electricity imported to Europe would be amongst the cheapest source of electricity and that includes transporting it," he says. "CSP imports would be much less vulnerable to interruption than are current imports of gas, oil and uranium." It's a realistic solution, and it's a solution we could implement now. Go to www.trecers.net/news.html for interview with Dr. Gerhard Knies at "BBC The World Tonight"
use the sun as a source of energy for a cleaner and healthier invironment why not use it.And by the way the intire earth will thank to those innovative people. The sun hitting mirrors are a great innovation of producing cheap solar power, because it is essentially infinite, so it never runs out, unlike fossil fuels. The amount of solar energy intercepted by the Earth every minute is greater than the amount of energy the world uses in fossil fuels each year. And people can get huge profit by using solar power. I thought I would add some relevent links for those interested in CSP. And a little CPV. Physicist Joseph Romm at climateprogress.org is a former secretary of energy for renewable energy and efficiency, in the Clinton Administration. He is an advocate of solar thermal and a prolific writer on all things climate change and energy. An interesting new company from Israel is Zenith Solar. They are developing a commercial version, of a concentrating PV solar system that produces electric power and hot water. "In conventional CPV systems, the excess heat generated in the solar cell needs to be removed to avoid damaging the cell and to maintain high efficiency of electricity conversion. ZenithSolar utilizes the heat generated at the solar cell receiver to provide usable hot water heating, improving overall solar power conversion efficiency to 75% ."